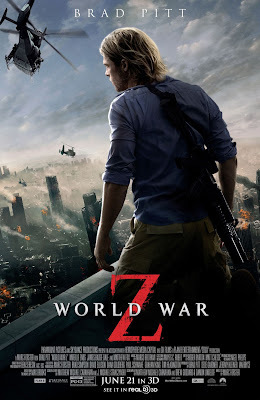 After what seems like half a year of advertisements World War Z is finally out at cinemas. Based on the popular book by Max Brooks it shot into mainstream due to famed actor Brad Pitt attaching himself to the project. I was actually due to interview Max Brooks at one point but unfortunately I was not free on the dates he was in London! A mysterious plague quickly sweeps the world turning normal humans into undead ghouls who exist solely to pass on their disease to non infected. Gerry Lane (Pitt) a former United Nations investigator and his family find themselves caught up in events as New York is rapidly consumed by the horror of the outbreak. His ex employees rescue Gerry and his family and ask him to assist a leading scientist in travelling to South Korea to try and find the origin of the disease in order to get a cure. Left with no choice Gerry reluctantly agrees, but his search for answers leads him on a wild goose chase around the world...a world over run with zombies. The book is a collection of different accounts on a zombie uprising told from around the world, not exactly the easiest book to turn into a film so it is no surprise that this is not really based on that too deeply. It does take place in many different locations including America, Jerusalem, Korea, and even Wales. The outbreak happens very quickly, the opening sequence in which Gerry comes face to face with it is very quick paced, utter chaos. The zombies are of the running type and are insanely fast, also quite good at free running it has to be said, clambering over walls and leaping over cars in gigantic numbers. Having seen the trailers where there are literal rivers of zombies I was concerned. They looked kinda ridiculous and I was left wondering if you would ever even see zombies on their own or if they would always be a mass of faceless monsters. Thankfully you do get to see zombies up close and actually leads to an intelligent reason for the difference between slow shambling zombies and the crazy running type. The effects for the zombies are quite good, one in particular had an Alien style teeth chattering noise that was memorable. For a zombie film there really is not much blood or gore at all, I didn't even stop to think about that until after I left the cinema. Certainly no The Walking Dead levels of gore but it didn't distract from anything. The zombies seem to be dancing when they stand still, I don't know if this was meant to be funny but it was hard not to laugh at the dancing zombies! On that note the scene when Gerry's daughter whizzes past in the background in an unmanned shopping trolley screaming had me laughing out loud, again not sure if that was the intended reaction. The plot does seem secondary to the action, each new location bringing with it new crazy action sequences much of which was shown in the trailers. If you have yet to see the trailer for World War Z then don't! I wish I could have gone into the film untainted as nearly every action sequence is shown in the trailer meaning I always knew what was going to happen next. 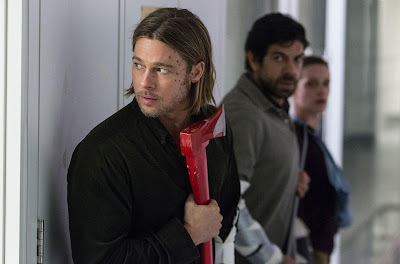 World War Z ran into a lot of problems during film that led to a totally new final part of the film. It is very different in tone to the rest of the film but this slower paced piece was by far the best part of World War Z. It had real tension; a thing that the rest of the film lost in its pursuit of big set pieces and wild action. It has some good ideas throughout though, the City of Jerusalem being safe due to huge walls hastily erected was a neat thing. Pitt is believable in his role even if there is not really much to the character of Gerry, his family also do a good enough job but there are not any stand out memorable characters but it is still an entertaining film and it really looks fantastic even in dreaded 3D (not a fan at all since seeing The Hobbit butchered by the damn thing). With the worldwide plot device used it does at times feel like a collection of disjointed tales, I am not sure if that was on purpose in keeping with the books separate accounts or if it was just a failing of the writers in keeping a cohesive story going. 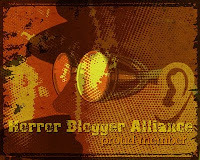 Far better than I expected it to be and anything that pushes zombies further into mainstream is very welcome by me. Not a bad film at all, could have been far, far worse. Looks like we came to the same conclusion! We certainly did, still was a lot better than the underwhelming trailer made me think!